Winter is my favorite time to visit Starbucks. The fun wintery themed drinks are available, they serve their coffee in the red cups, and Cranberry Bliss Bars are available. 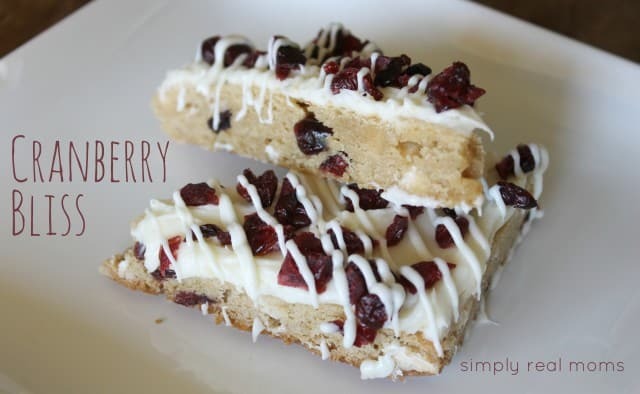 The Cranberry Bliss bars have to be my absolute favorite treat at the ‘bucks, and I can’t resist their tempting deliciousness when I order my coffee…I usually get a Cranberry Bliss bar as well. They aren’t exactly cheap to get, but every once in a while its a nice treat. I went to get a tray of them once for a morning playdate (you can totally buy an entire tray!!) and I was shocked at my bill that day. I knew I needed to find the perfect copycat recipe so that I could bring them along to other occasions any time of year AND without breaking the bank! Here is the tried and tested recipe! I tried a few different things and tweaked it a bit each time, but this is pretty darn close!! Cut it into triangles like Starbucks, or into smaller bite sized squares for little party treats! Preheat the oven to 350 degrees. Line a 9x13-inch baking dish with parchment paper. This is important- feel free to use non-stick spray, but mine got stuck in the pan with just non-stick spray. Spread the batter into your pan. Bake for 20-25 minutes or until a toothpick inserted near the center comes out clean. Cool completely in the pan or on a cookie rack. To make the topping: Beat the cream cheese and powdered sugar until combined. Slowly add half of the melted white chocolate and beat until blended. Spread this mixture onto your baked first layer. Sprinkle with chopped cranberries. Drizzle with remaining melted white chocolate by putting chocolate into a ziplock bag and snipping the corner off-squeeze and drizzle evenly. Let the topping set in the refrigerator, then cut into bars- square or triangle shaped (like Starbucks!). Store in the refrigerator until ready to serve. OMG!! !…These look amazing! !….This is a must try!